Competition 2016, Schematic Design 2017-18, Design Documentation 2019. Collab with studený architekti. 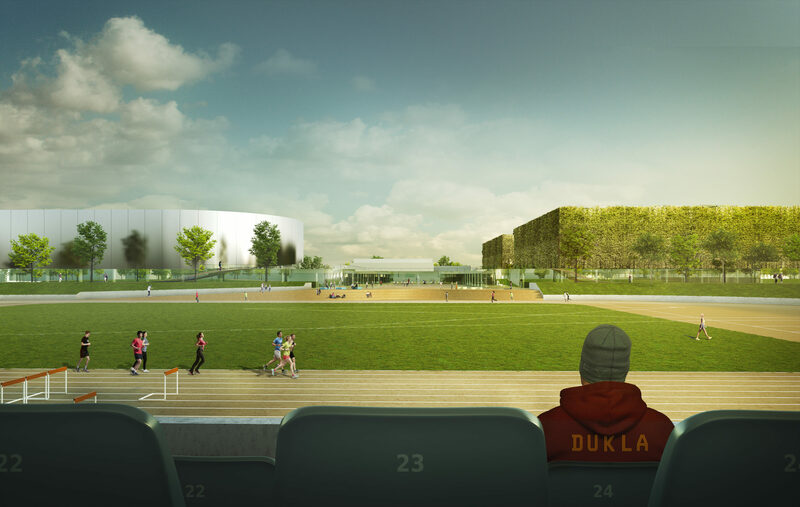 The Sport Link provides a focal point and image for Dukla. It connects all sports and includes common programs and activities in its 2 parallel bars. By cutting into the athletic stadium, it extends the elevated topography of its rim to provide additional access to all tribunes. 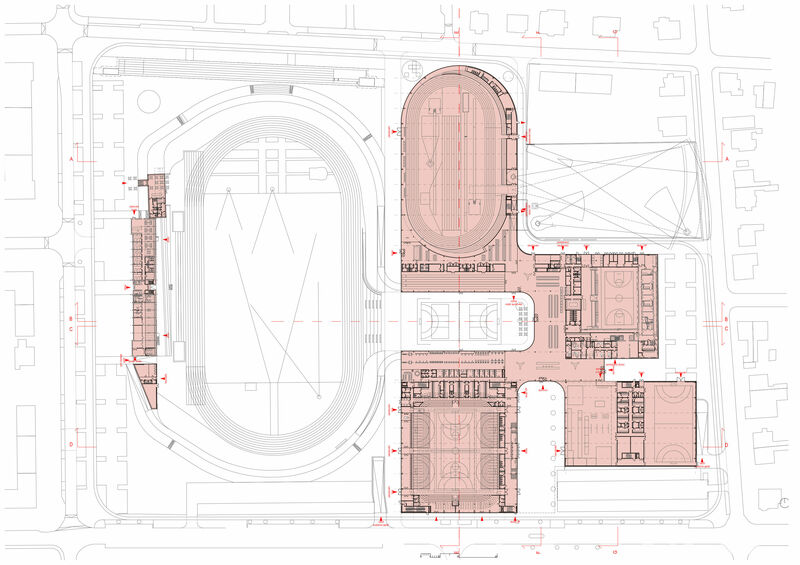 In the center of the site, a continuous space emerges to frame sports, leisure and communal events. It invites the city to ow in through a meandering boundary: shared space, green meadows, a formal piazza and sport fields. The sport bowl, the arena, the stadium, the tribune: all are spatial images of a community, captured by a common experience. 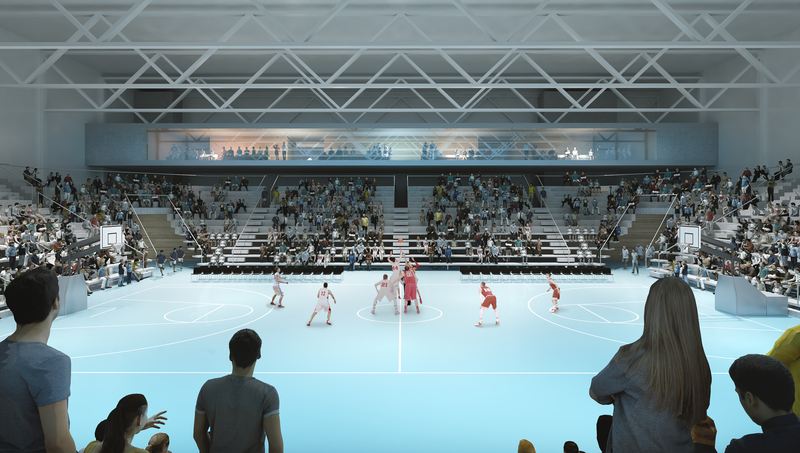 The project reinforces the geometrical expression of togetherness: playing, competing, cheering, rooting for a common team. It proposes a lens connecting all activities of the site – the Sport Link. This multipurpose space cuts into the athletic stadium to becomes a focal point for the entire site. It extends the oval caldera into an inclusive topography that is partly architecture, partly landscape. Its 2 parallel bars comprise common programs, such a restaurant and cafe. The Sport Link with the main reception provides access to changing rooms and sport fields, all located on ground level. The spectator areas are also accessible from the city through peripheral entrances, and from the elevated loop that links all tribunes through the landscape ridge running atop the athletic stadium and Sport Link. The topography of the extended mound creates a loop that negotiates the boundary to the surrounding city. On its outside, it provides the public with popular playing fields, connected through a peripheral running loop and easily accessible at all times. 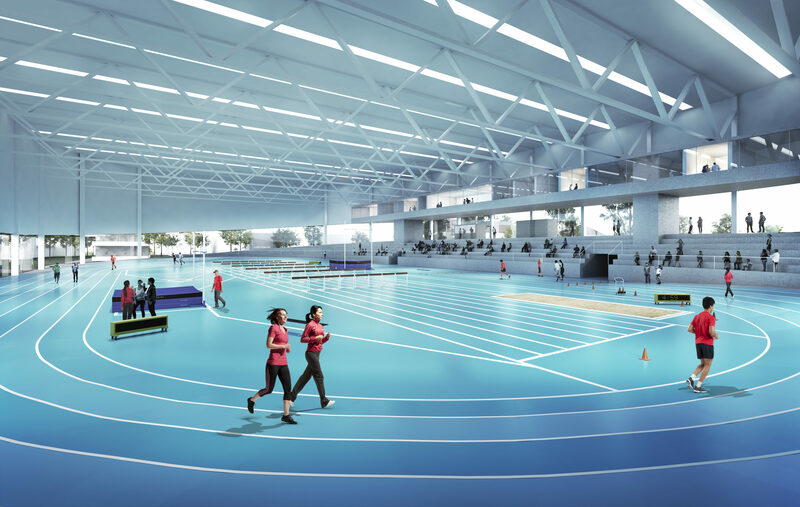 On the inside, it is activated by the central running loop and elevated pedestrian paths accessing all the sport stands from an elevated platform. Ramps and stairs connect both loops continuously. A shared space ties the school to the block. It extends the arboretum southwards through additional trees. It provides access to the Space Link from the North, and is equipped with benches, skate ramps and bowling grounds. All traffic modes share this elevated platform separated from the surrounding streets by its paving. 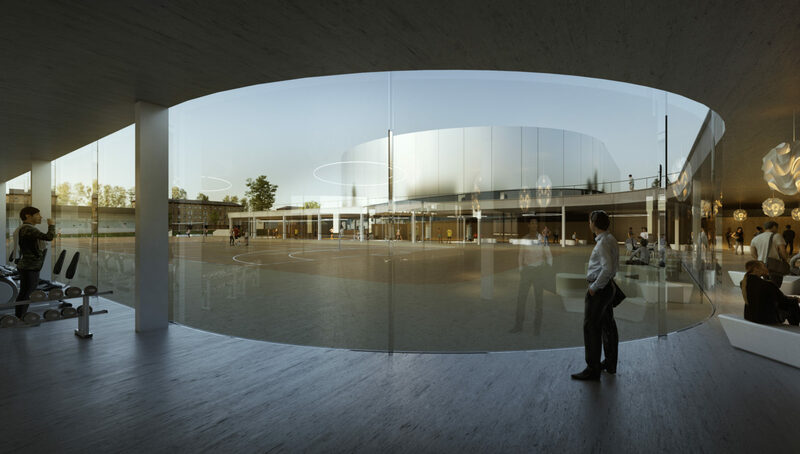 The school extension is aligned to the sport halls, reinforcing the legibility of the urban concept. On its western boundary, the project refreshes the original strip of poplar tree landscape in front of the 50’s housing, creating a continuous green space related to the arboretum.